A British woman is facing two years in jail in Dubai for calling her ex-husband's new wife a "horse" on Facebook, campaigners have said. Laleh Shahravesh, 55, was arrested at a Dubai airport after flying there to attend her former husband's funeral. She faces prosecution over two Facebook comments she posted on pictures of her husband remarrying in 2016. Ms Shahravesh's 14-year-old daughter, Paris, has written to Dubai's ruler asking for her mother's release. The Foreign Office said it was supporting the mother-of-one. 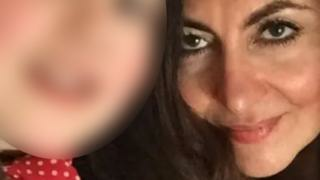 Ms Shahravesh was married to her ex-husband for 18 years, during which time she lived in the United Arab Emirates for eight months, according to the campaign group Detained in Dubai. While she returned to the UK with her daughter, her husband stayed in the United Arab Emirates, and the couple got divorced. Ms Shahravesh discovered her ex-husband was remarrying when she saw photos of the new couple on Facebook. She posted two comments in Farsi, including one that said: "I hope you go under the ground you idiot. Damn you. You left me for this horse." Under the UAE's cyber-crime laws, a person can be jailed or fined for making defamatory statements on social media. Detained in Dubai said Ms Shahravesh could be sentenced to up to two years in prison or fined £50,000, despite the fact the 55-year-old wrote the Facebook posts while in the UK. The organisation said Ms Shahravesh's ex-husband's new wife, who lives in Dubai, had reported the comments. It said Ms Shahravesh and her daughter flew to the UAE on 10 March to attend the funeral of their husband and father, who had died of a heart attack. At the time of her arrest, Ms Shahravesh was with her daughter Paris, who later had to fly home on her own, it added. In a letter to to the ruler of Dubai, Sheikh Mohammed Bin Rashid al-Maktoum, Paris said her mother had been forced to sign a statement by police that was "written in Arabic, which she did not understand". She added: "I cannot emphasise enough how scared I felt, especially after losing my father just a week before, as I was having to worry about losing my mother as well." Closing the letter, she wrote: "I ask kindly: please, please return my mother's passport, and let her come home." The chief executive of Detained in Dubai, Radha Stirling, told BBC News that both her organisation and the Foreign Office (FCO) had asked the complainant to withdraw the allegation, but she had refused. Ms Stirling said her client had been bailed, but her passport had been confiscated and she was currently living in a hotel. She said Ms Shahravesh was "absolutely distraught" and it was going to take her a long time to recover from her ordeal. Her daughter was "very upset" and had "been through really what you would call hell", she said. "All she wants is to be reunited with her mother," Ms Stirling added. The 14-year-old was putting together an appeal in her mother's case, Ms Stirling said. She added that "no-one would really be aware" of the severity of cyber-crime laws in the UAE, and the FCO had failed to adequately warn tourists about them. The FCO said in a statement: "Our staff are supporting a British woman and her family following her detention in the UAE. "We are in contact with the UAE authorities regarding her case."